The holidays are right around the corner. What do you get the Phish fan who has everything? Ice cream. 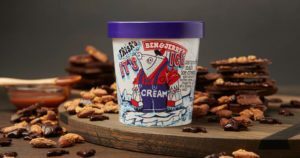 Ben & Jerry’s has collaborated with Phish and The WaterWheel Foundation to create a limited flavor, “It’s Ice… Cream”, a caramel malt ice cream with almond toffee pieces, fudge fish, and a caramel swirl. The packaging and a VERY limited tee shirt were designed by Jim Pollock. A portion of the proceeds for the ice cream and all of the proceeds for the tees are donated to The WaterWheel Foundation. The ice cream and tees can be ordered at www.store.benjerry.com. If you use promo code “OSIRIS”, you can get free shipping on all orders over $50 for the rest of 2018.